LOVELAND, OH. – As Jews around the world celebrate the ancient miracles of Hanukkah, the Kadish family will celebrate Ethan, their modern-day miracle. 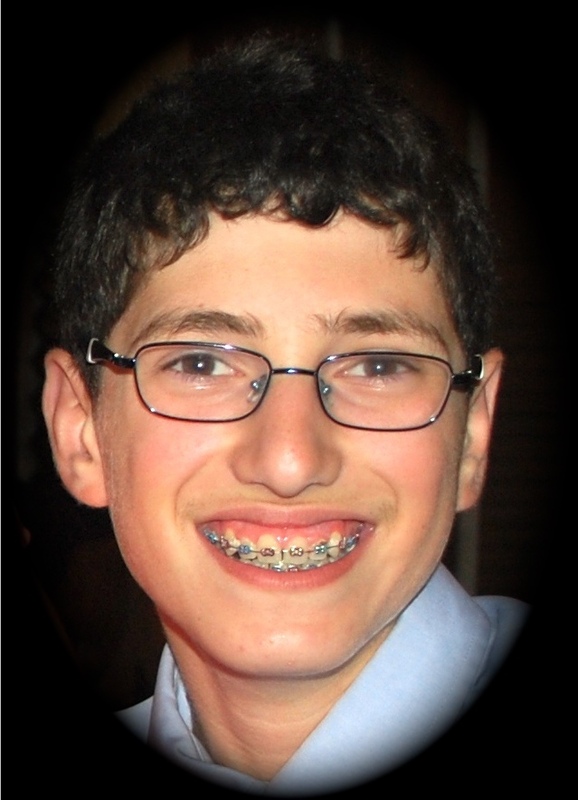 Ethan Kadish is the 13-year-old Loveland boy who was struck by lightning June 29 while he was at a Jewish summer camp near Indianapolis. The powerful strike stopped his heart. His brain went without an adequate supply of oxygen or blood as camp staff franatically used CPR and defibrillators working to revive him. After many minutes – his parents aren’t sure how many – his heart finally started pumping again. Every day since then, Ethan has fought to recover and remake connections in the parts of his brain that were injured from the lack of oxygen. He can’t yet talk. But he breathes on his own now. He eats through a feeding tube in his abdomen. He’s growing taller. And, sometimes he laughs or flashes a wide smile at his mother and father or younger sister and older brother, offering a glimpse of the Ethan who left for camp June 11. That is the miracle of Ethan. That’s a life Ethan’s parents are grateful they don’t have to face. And this year, as Hanukkah begins the evening before Thanksgiving, Scott and Alexia Kadish are quick to express gratitude on many other fronts, too. They are grateful to the doctors, nurses and therapists helping Ethan through his recovery. They appreciate their families, rabbis and friends and the hundreds of volunteers – many of whom they’ve never met – who have supported them and their children through this time of crisis. Mostly, though, they’re thankful for Ethan – for his strength, resilience and determination. The rest of the world knows Ethan Kadish as the boy struck by lightning while playing outside – an innocent victim of a random, violent, unpredictable act. 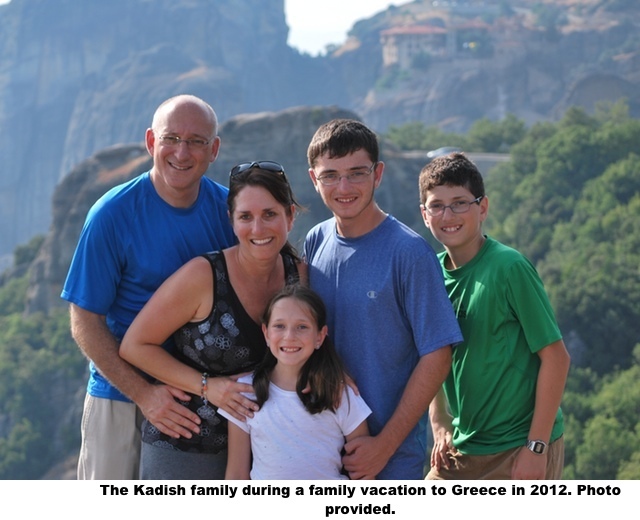 It’s different for the Kadish family and their friends. For them, Ethan’s story begins long before that terrible day. He was the ideal, easy-going baby who slept through the night just days after first coming home from the hospital. He is the middle child, who looked up to his 16-year-old brother, Zakary, and still played board games with his 10-year-old sister, Elyse. He’s the lover of roller coasters, theater and all things sports. He’s the consummate team player. And the most loyal of friends. He’s also the typical teen who would roll his eyes when his parents danced to Top 40 hits in his room. “Ethan jumped in with both feet, embraced life and all things adventurous,” his mom says. Ethan is a performer, too. 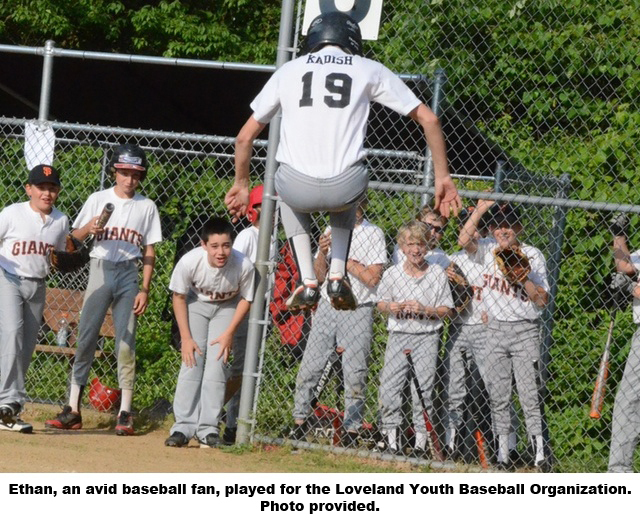 He won a part in Loveland High School’s 2013 spring production of “The Music Man” as a seventh grader. Ethan got a role as one of the salesmen on the train in the opening scene. He helped introduce Harold Hill, the musical’s male lead, and had far more lines than he ever let on to his parents. Ethan couldn’t wait to try out for the play again in eighth grade because he loved the stage so much. But after June 29, eighth grade would have to wait. There is so much of Ethan that his injury hides; so much that has been put on hold. Ethan turned 13 on July 19, a birthday that made him “a son of the commandments” in the Jewish faith. Instead of marking the day with a teen-sized slab of his favorite cake, Ethan was at Cincinnati Children’s Hospital Medical Center. His Bar Mitzvah, the coming of age ritual in the Jewish faith, was supposed to be Aug. 24. Ethan had learned his reading from the Torah, even before he left for summer camp. His parents bought special head coverings known as kippot for the celebration in two different shades of blue. 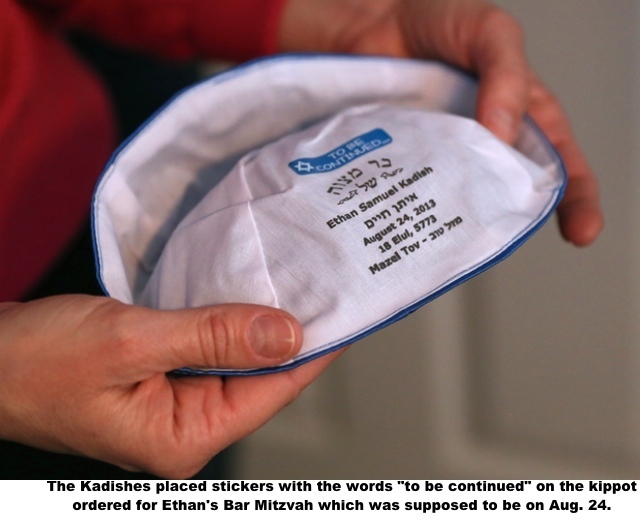 They are embroidered with Ethan’s name, his Hebrew name and the date of his Bar Mitzvah. It would be simple to say Ethan’s life, or at least his childhood, is on hold while he fights to recover from that lightning strike. But life has kept going. And most of the past five months of Ethan’s life have taken place in a hospital. His first four days were spent in Indianapolis at a hospital much closer to Goldman Union Camp Institute where Ethan was teaching younger campers how to play Ultimate Frisbee when he was struck. He was strong enough to be flown to Cincinnati Children’s on July 3. By then, people around the world knew the name Ethan Kadish and the horrible thing he had survived because of newspaper and television accounts and the story spreading through social media. Ethan’s Aunty Suzanne started a Caring Bridge page, an Internet journal for people who are sick or injured, the day he was hurt to keep friends and family updated on his condition. Alexia and Scott Kadish were careful about what they shared on that page. They knew Ethan’s friends would be reading. They didn’t want to frighten anyone. But by July 10, Ethan’s 12th day in the hospital, they realized many friends thought Ethan was recovering much faster than he actually was. They wanted to be clear that this would take a while. It wasn’t until Ethan’s 48th day in the hospital, on Aug. 15, when his parents decided to explain in detail what Ethan was going through. The words jump off the screen. Scott and Alexia Kadish also realized their family would need more than the outpouring of emotional support they already had received from their friends, family and even complete strangers. They would need money to care for Ethan. Asking for financial help wasn’t easy for the Kadishes. Scott Kadish has worked for the Procter & Gamble Co. for more than 23 years. He’s a group manager in the company’s purchasing organization. Alexia Kadish was working as a part-time copy editor at The American Israelite , a Cincinnati Jewish newspaper, before Ethan’s injury. They come from families who believe in spending less than you earn, saving money for vacations and big-ticket items and giving to the less fortunate. They felt certain they could take care of Ethan. But then they learned Ethan’s yearly medical expenses could top $1 million. No health insurance policy is designed for that. No average family can save enough. The Kadishes are a family of givers, says Julia Weinstein, whose son, Asher, is a close friend of Ethan’s. Weinstein thinks the Kadishes are the reason that Ethan’s story has resonated with people around the Tri-State, around the country and around the world. “Team Ethan” has 400 volunteers locally who have been helping the family by cooking meals, staying overnight with Ethan in the hospital and even watching the family dog, Cincy, during the day. Volunteers donated the labor and materials to modify the Kadish home in Loveland so Ethan could have a bedroom on the first floor, an adjacent bathroom with a zero-entry shower and a wheelchair lift in the garage. Weinstein uses three words to describe the Kadishes: faith, strength and grace. People see it in their faces and read it in the words Alexia and Scott post at their new web page, JoinTeamEthan.org , or on the Join Team Ethan Facebook page . Support for the Kadishes reaches well beyond the people who know them. Scott Kadish thinks that’s because Ethan could be anyone’s child – any child playing outside on a sunny day struck down out of nowhere. Jewish rock musician Dan Nichols thinks it’s bigger than that. Ethan’s story, he says, means something more to the Jewish community in particular. “I think our Jewish identity is up for review at a moment like this where life presents something so real and so powerful and so painful and also so shocking and unexpected,” Nichols says. Jews believe in being closer to God through acts of kindness, holiness and healing. In this case, by helping the Kadishes, he says. Whatever the reason, the help keeps coming. And the Kadish family will need it for a long time to come. Ethan was back in the hospital just three days after his Nov. 20 homecoming. His stay was short this time, and he’s back home again in time to watch the lighting of the menorah for Hanukkah and smell the turkey cooking for Thanksgiving. 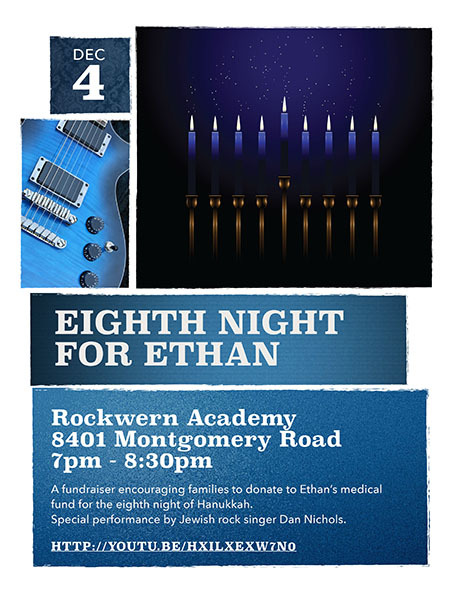 Ethan’s family knows his recovery won’t be easy. They know it won’t be quick. WCPO reporter Lucy May and WCPO photojournalist Emily Maxwell are following the progress of Ethan Kadish as he continues to recover from being struck by lightning on June 29, 2013. This is the first installment.